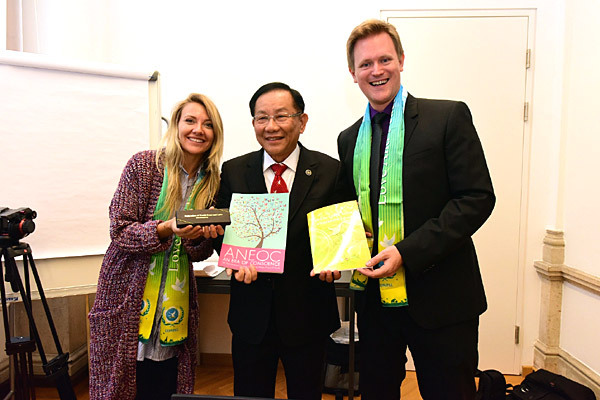 Dr. Hong, Tao-Tze (middle), president of FOWPAL and Zhang-men-ren of Tai Ji Men, had a joyful conversation with Marco Niebauer (right), chief of staff of the office of Executive City Councillor Andreas Mailath-Pokorny of Vienna, and Daniela Mantarliewa (left), the councillor's spokeswoman. The cultural goodwill delegations of Tai Ji Men and the Federation of World Peace and Love (FOWPAL) arrived in Vienna, Austria on October 19, 2017. The delegation visited its city hall and city council. Mr. Andreas Mailath-Pokorny, executive city councillor of Vienna for cultural affairs, science and sports, especially asked Marco Niebauer, chief of staff of his office, and Daniela Mantarliewa, his spokeswoman, to receive the delegation. The delegation had a joyful conversation with them, sharing promotion of love and peace through cultural exchanges across the planet. Mr. Niebauer admired what the Cultural Goodwill Delegations had done and stressed that the power of a single person is limited but the joint efforts of many can change the world. Over the past 17 years, the Cultural Goodwill Delegations has visited 75 nations across every populated continent to continuously foster the ideas of love and peace. In 2005, it was cordially invited to conduct cultural exchanges in European countries, including Italy and the Netherlands, and was well-received. Dr. Hong, Tao-Tze, the president of the Federation of World Peace and Love (FOWPAL) and Zhang-men-ren of Tai Ji Men, met with Pope Benedict XVI at the Vatican. Dr. Hong congratulated His Holiness on his new post and shared with him, "No love, no peace. Peace needs love, and love needs to be balanced." Under Dr. Hong's leadership, the members of Cultural Goodwill Delegations have visited many cities across the Earth, promoting love and peace. In early October this year, the Cultural Goodwill Delegations visited Eastern European countries, including Russia, Estonia, Latvia, Lithuania, and Poland. Afterwards, it visited Central Europe and arrived in Austria on October 19 to conduct cultural exchanges. Known as the world capital of music, Vienna is the capital of Austria. Over a quarter of Austria's population lives in the city, and its historic center is a UNESCO World Heritage Site. With its high quality of living and low crime rates, many important international organizations have their headquarters in the city, including Organization for Security and Co-operation in Europe, OPEC, and the International Press Institute. Additionally, one of the four UN offices is also located in Vienna, with the other three in New York, USA; Geneva, Switzerland; and Nairobi, Kenya respectively. Today, Vienna is the second largest German-speaking city, after Berlin. Dr. Hong, Tao-Tze, president of FOWPAL and Zhang-men-ren of Tai Ji Men, pointed out that the impacts of cultural exchanges are profound. He shared Tai Ji Men's participation in the 2017 Summer Universiade and the meaning of martial arts: Over 140 nations and regions participated in the event, and Tai Ji Men presented the first performance in the opening ceremony. Its presentation conveyed the highest level of martial arts—ending conflicts and promoting peace. Peace is also the spirit of the Olympic Games. The Chinese character for martial arts is composed of two parts--to end and war, meaning to stop war. Martial arts are not for competition or fighting; the highest martial arts are to defuse conflicts with wisdom and are about peace and love. Ms. Daniela Mantarliewa welcomed the Cultural Goodwill Delegations to Vienna and its city hall. She affirmed the Delegation's promotion of love and peace and believes that love and peace are the most important things for humanity. She said, "We would like to support you because it is really very important to work together for a better world, for protecting and preserving peace, and for spreading love in the world." Mr. Marco Niebauer praised FOWPAL's peace endeavors: "In times when we have war in the world, it is very important that we have initiative like this which helps us to get more freedom in our countries and all over the world. . . . That's the most important thing. You get connections. You get cooperation, international cooperation, because only one person can't change the world, but the more you are, the more we are, the more we can do."